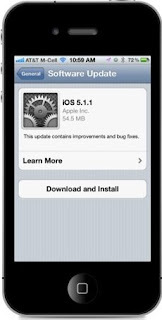 Home announcements iOS 5 Jailbreaking News iOS 5.1.1 Tether Jailbreak Available For Older Devices – Learn How! iOS 5.1.1 Tether Jailbreak Available For Older Devices – Learn How! Promptly after the iOS 5.1.1 release bringing multiple improvements, the hackers seem not to be wasting their time, offering that the jailbreak of the older devices running on the latest Apple mobile OS is quite possible using last month’s Redsn0w! 2. Connect your iDevice to your PC, select DFU mode, and run RedSn0w you’ve downloaded in step 1. 4. Once the iOS 5.1 is properly identified by RedSn0w, go back to the RedSn0w homepage and pick Jailbreak. 5. When you’re asked to install Cydia, click Next. 6. Once Cydia is installed, your iDevice will reboot, so you need to place your iDevice back again into the DFU mode. 7. Go back to the Extras page and click Just Boot to perform a tethered boot via RedSn0w. Once rebooted successfully, a usable Cydia icon will appear on your Home screen! It’s that easy!